Adventure Guide | Old Chapel Training 27th-31st Aug.
Old Chapel Training 27th-31st Aug.
Having worked with a group for 18 months and brought their training to a conclusion with a fabulous trip to Turkey, I am inevitably concerned that a new group so soon may prove more difficult to work with. This last week I need not have worried for the Indonesia group are already a fantastic group of young people. I could not have asked for a more positive and responsive group. 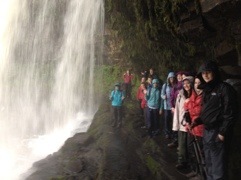 The week started wet, in fact very wet, so I decided they needed to get even wetter and took them to the series of waterfalls in the Dinas Gorge. As we drove over the Brecon Beacons from Crickhowell it became clear that the weather was much worse the further south and west we travelled. Parking the bus at Pen-y-Porth, we walked south along the Afon Mellte, bypassing some of the higher falls to first visit Sgwd yr Elra. Recent rain had made them quite impressive, particularly for the time of year. I don’t think I have ever seen the paths so waterlogged at any time of year as they were this week. Sgwd yr Elra has quite a large lip to it allowing us to walk behind it without getting too wet, other than from the fine spray. Briefly retracing our steps we next visited Sgwd y Pannwr before walking up stream to Sgwd Isaf Clun-gwyn, which you can also go behind but not without walking through the fall. This was optional for the group but I was pleased that some took the opportunity to take full advantage of the experience. It was a wonderful half day walk in some fairly horrible conditions. The weather was much better the following day so the group was split into two for an orienteering exercise on the hills above the Old Chapel on the eastern side of the Grwyne Fechan Valley. This course involves a photograph being taken at each checkpoint. Points are awarded for originality and composition. Depending on how long the groups spend taking photographs the circular course can take anything from three to five hours. Both teams coped well with the clues, took some well thought out pictures and the final results were very close. By the time they returned from the orienteering they needed to cool down so I took them on a river walk. 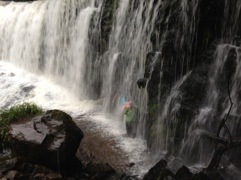 This involves walking up stream in the Grwyne Fechan river for about 300m just below the Old Chapel. The recent rain meant that the river was running quite full and fast. To ensure that they all got properly wet they had to negotiate a number of obstacles in the river. The next day was all about team development through problem solving. They had a number of exercises to achieve, often against the clock and with red herrings thrown in to confuse. Everybody had an opportunity to lead and all performed superbly well. Having been doing these for many years I can genuinely say they this group has performed better than any other I can recall. They completed the web in record time, also the Kingdom of the Blind exercise in a staggeringly quick time of 24 minutes. They were so fired up by it that they requested to do it again, changing the roles and still did it in a quick 34 minutes. I have known groups take as long as three hours! Every exercise they tackled they tackled with optimistic enthusiasm, calmness and determination. They gave the leaders the chance to lead, they listened to each other and they made decisions wisely. It was a joy to see them all working so well together. During the day they managed to break a number of records. Their achievements were made all the more remarkable by the foul weather we experienced most of the day. Thursday was a full day out on the hills. The weather improved significantly and we focused our attention on the western edges of the Grwyne Fechan Valley, walking up McNamara’s Road to the col, south along the ridge to Pen Allt-mawr and Pen Cerrig-calch, before descending and heading back to the Old Chapel. In the evening the group worked on an entertainment for each other and the staff. It never ceases to amaze me how readily they rise to the challenge and produce something worthwhile in such a short time. The last day was spent working on more team building exercises before a short walk over Sugarloaf from Forest Coalpit to Mynyyd Llanwenarth and the Friday evening journey home. I think we are going to have fun in Indonesia and they are going to get a great deal out of the experience. Roll on the next training exercise, a two day/one night orienteering exercise on the Malvern Hills. This entry was posted in News by jwalton. Bookmark the permalink.